BBC NEWS | Have Your Say | Was Piers Morgan's sacking right? Daily Mirror editor Piers Morgan has been sacked after the paper published faked photos of soldiers abusing an Iraqi prisoner. In a statement the paper said it had fallen victim to a "calculated and malicious hoax". The board said it would be "inappropriate" for Morgan to continue. The Queen's Lancashire Regiment has accepted an apology from the Mirror but called for the newspaper to help root out those responsible for the photos. The Mirror story caused a political storm and was followed by news of two human rights group reports on the treatment of Iraqi prisoners and civilians. Should the Mirror have sacked Piers Morgan? Where does this leave the investigation of abuses by British forces? Send us your views. 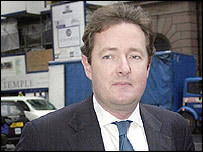 I remember seeing Piers Morgan on the BBC's "Question Time" and thought what an over-opinionated person he was. I also reflected that one day he will get his come-uppance and sure enough he has. He had to go. How many times do we see newspapers publish sensational items just to sell them? People do not buy good news, and are very gullible to the gutter press. The real puzzle is why he was given the job in the first place? Yes he had to go. He saw the photos as a sales pitch. He had them published without the slightest interest what harm they would do. He should make a front page public apology. Piers Morgan has gone. Tony Blair is still in office. Both made errors of judgement. The buck stopped with him. Now he should do the honourable thing and co-operate fully with the inevitable investigations. Morgan's sacking was rightly justified. It is worrying to know that an editor of a newspaper didn't have the foresight to check their credibility which has only added to the growing problems in Iraq and the war against terrorism. Why should newspaper editors be subjected to more stringent rules of "truthfulness" than politicians? Why should newspaper editors be subjected to more stringent rules of "truthfulness" than politicians? Morgan should only have been sacked if it could be proved that he had known in advance that the photos were faked. The government took the UK to war on the back of a "dodgy dossier", yet no one, from Blair downwards, has resigned as a result of the failure to find WMDs. Absolutely. The damage that the pictures may have done to the British reputation as well as soldiers in the field is enormous. The Mirror should have been much more thorough in their investigation of the pictures and their source. Absolutely right to sack him. Yes, there are bad eggs in the British Army who overstep the mark - it's the same in every organisation. The last thing our fathers, sons and husbands need in Iraq is to give a sensitive situation an excuse for more hits against them. Any responsible person would have thought about the innocent majority of soldiers before publishing these photos. The DG and Chairman of the BBC and now the editor of the Mirror. So when is one of the politicians who misled this country into an illegal, unjust and unnecessary war going to do the decent thing and resign? Surely their mistakes were far greater. Had he placed the images in the editorial, or opinion pages of his paper, then no. He shouldn't have been sacked. But by placing them on the front page they were communicated as fact. He misled the British Public and placed the lives of innocents at risk by this abuse of his position. While the Mirror's pictures helped stop prison abuse they have significantly hampered the hearts and minds campaign. I think Morgan did the right thing by publishing the pictures, but he has a responsible position and must face the consequences. Absolutely. He clearly made a fatal error of judgement, and on top of that went on to sensationalise something that would not only damage the reputation of the armed forces but put innocent lives at risk. Being fired was the least the Mirror could do, and clearly it was taking interest, as always, in itself. Not the truth, not good journalism, not the lives of soldiers, civilians, nor even the real instances of human rights abuse, just its own sales, its own survival. The sacking of Piers Morgan was absolutely justified. As he was the editor of the Mirror it should have been his responsibility to ensure that the photographs were verified as being genuine before publishing. No it is not right to sack him. He did this in good faith and how do we the British public know that these photos are fake? Because the government says so - and we all believe them don't we!!!!!! I would have thought as an experienced journalist Mr Morgan should have fully researched his sources etc prior to publishing to prevent exactly what has happened. He had to go. Not only was he badly duped by the worst hoax since the Hitler diaries, but the repercussions his mistake has caused for British troops couldn't be more serious. At last we have justice! Yes, the Mirror was right to take this action. The irresponsible actions of this man have put our lads in Iraq at serious risk. It's about time the gutter press became more responsible and less self-seeking. Let this be a lesson to all of them. So first the BBC and now the Mirror silenced for producing material that if not true was nearer the truth than the government and the right wing shareholders of the Mirror would like us to believe. Where do we go from here? Very disappointed to see Mr Morgan has been sacked. Whether the particular photos are fake or not, he has brought a very important issue to prominence and deserves our thanks for that. Any information so critical to safety should first be thoroughly investigated to confirm it is true. As always, the press were too keen to get a story into print. Since Morgan was the editor, he had no choice but to go. However, now the Mirror should be considering how it can reverse the damage it has done to our already over stretched army. Piers Morgan should not have lost his job, he was only drawing attention to an alarming and unknown aspect of the ever-growing debacle that is the Iraq war. Editors of national newspapers carry a huge responsibility to report the news correctly and without bias. Morgan's own anti-war bias led him to report incorrectly and to endanger the lives of his fellow citizens abroad. It was absolutely right that he was fired. Excellent decision - maybe this will represent a turning point in the scandalous misrepresentation of the war against terrorism that will in history be acknowledged - if we win - as the saving of humanity. Why if it was in the public interest would an editor be sacked for publishing what he thought was genuine? Other editors think before you print!! The sacking is right in my opinion; the tabloid press has behaved terribly over the last month or so in relation to the conflict in Iraq. They have published stories purely in the interests of ratings which have endangered our troops. In my opinion the tabloid press needs to be brought down a peg or two. Yes, yes and yes again. Abuses may well have occurred and should still be investigated, but the damage done as a result of the Mirror's folly is incalculable. Piers Morgan always insisted that the government and Army take responsibility for their actions over the alleged abuse in Iraq. It is only proper that he should be sacked for his complete failure to understand the full implications of his decision to publish the fake photos. Absolutely right that he should go, this was despicable but more so a reflection of the quality and lack of morals of our press. I'll say he should be sacked. As editor he should have satisfied himself beyond any doubt whatsoever that the photos were genuine. The responsibility for the greater danger that our troops may be in because of this fiasco lies with Morgan. Yes...Mr Morgan should have been sacked. The press has a responsibility to ensure the stories and photographs they publish are accurate, especially when the possible backlash is so great. A simple "sorry" on page 14 after the fact simply isn't good enough. Certainly, the publication of these photographs in the first place was extremely irresponsible. Now they have been proven fake it makes this whole episode even more disgraceful! Only the passage of time will tell whether or not Piers Morgan's sacking was right or wrong. Morgan sacked! He who lives by the sword shall die by the sword....How wonderful. Now this is good news for a change. The actions of the Daily Mirror are, in my opinion, traitorous. They should be supporting our army, not participating in criticising it. News editors have more power over the hearts and minds of the people than politicians. Unlike politicians, when reporters give their opinions dressed up as hard fact, we usually believe what we're told. For too long Piers Morgan refused to accept that the Mirror could have been selling a lie. The sacking was a sad necessity. Yes, the entire board should resign as well, as they appointed this idiot. The damage he has done to the reputation of our service personnel is disgusting and inflamed a volatile situation. I will never buy the Mirror again. Long overdue! It should also be remembered in all this talk of "good faith" this editor paid for these fake photos. Now he's paid the price for his ego trip. Yes it was right. The Mirror should be fined an amount equivalent to the proceeds from every paper sold since the photos were published. Conversely, I'll be extremely interested to see Downing Street's response....Can anyone see 'Evidence of Weapons of Mass Destruction?" Any criticism of Morgan by the government, for me, will reek of hypocrisy. Piers Morgan should not have been sacked. Editors can never be 100% certain of a source's trustworthiness. If they had to be, no stories would ever be printed. Morgan made a brave decision - to take the opportunity to highlight the vile and unacceptable treatment of prisoners in Iraq (which numerous witnesses have corroborated). Even if these pictures did not depict a genuine incident, they are likely to be fairly representative of the kind of things that are happening. It is Geoff Hoon and Tony Blair, not Piers Morgan, whose heads should roll - for pretending that the issue of the pictures' authenticity is the overriding one, when it is the wider issue of our troops' behaviour towards prisoners. The damage caused by Piers Morgan in incalculable. The QLR should sue the Mirror Group for defamation. No, he shouldn't have been sacked. He checked his sources and had no reason to suspect that the pictures were faked. Regardless of which they have led to an atmosphere in which other organisations have been able to reveal their own concerns which the UK government did nothing about. Faked or not (and I don't believe the government have conclusively proved they are faked any more than The Mirror has proved they are not) they have served the public interest by revealing facts the government sought to repress. Sacking is too good for this irresponsible, arrogant excuse of a man. He should be put in the Tower and left to rot. He must have known the repercussions of publishing those photos whether he believed them to be fake or not. Piers Morgan should be personally charged with libel and made to pay compensation from his own pocket to the Queen's Lancashire Regiment. What he has clearly maliciously taken great delight in doing in inexcusable and unforgivable. If one single British soldier comes to harm as a result of his paper's pictures and words he should be charged as an accessory to the crime. Nothing he or the Daily Mirror says now can undo the harm they have done. Freedom of speech in a democratic country is something to be respected and used responsibly by the press, not abused and debased as it shames us all. I must say that Mr Morgan's judgement has been questionable from the outset. In a clear attempt to create a sensation, he published as real photographs that his own staff should have been able to warn him were probably fake. In doing so, he created a perfect distraction from REAL accusations against British forces. He has managed to damage the reputation of the British press and handed the government an excuse to brush aside accusations of misconduct. No matter what his motives (and I suspect they were pure desire for sensation and sales), he has achieved nothing good. Piers Morgan represents everything that is wrong with modern journalism. I'm glad he's no longer at the helm of an opinion forming newspaper but fearful of where this odious little man will pop up next. Absolutely! Although I do not agree with this war and furthermore do not support UK troops in Iraq, there is no justification in publishing pictures that are clearly suspect. Isn't it about time that the gutter press in this country is closed down for good, whichever political party they support. No. Given what's gone on in that Iraqi jail, Mr Morgan can hardly be blamed for being misled into publishing the wrong photos. Maybe the paper should re-publish the real photos of US/coalition soldiers abusing Iraqi prisoners. This will at least make the point that much of the publicity surrounding the Mirror's "lapse" is to divert attention from the actual and verifiable atrocities that have taken place in Baghdad's jail with British forces' knowledge. Piers Morgan is a courageous journalist who, in this one instance made an error of judgement, but that is hardly worth a resignation. The real villains here are Bush and Blair. Their errors of judgement are monumental in comparison with that of a mere Morgan. Sacked? He should be tried for treason. It's sad, that in this day and age, it's more important to sell newspapers rather than find out if a story is actually true. The Mirror has tarnished its image, perhaps irrevocably. Who will now believe a single word they print?